Robert Mooren, or “Just Bob,” as he is known to his friends, grew up on a dairy farm near the town of Oneida in Northeastern Wisconsin and graduated from Abbot Pennings Catholic High School in DePere. In the intervening years, he has earned certifications from Fox Valley Technical College in various aspects of maintenance and construction work. He has three children, two stepchildren, and six grandchildren in Texas, Nevada, and Wisconsin. 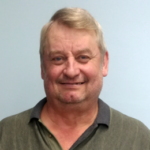 Before joining our staff, Bob was Building and Grounds Supervisor at Holy Cross Parish in Kaukauna. His journey to St. Anthony’s is a little bit unusual and quite wonderful. Bob and his wife, Janet Hoks, a faithful volunteer at St. Anthony’s, made a private retreat here on the 5th and 6th of July 2018. Before leaving, Bob took the grand tour of the building and grounds with our outgoing Building and Grounds Supervisor, Aaron Martin, who happened to mention that his position would be soon be open. Bob mentioned to Janet that he would be interested in the job, and Janet, in turn, mentioned her husband’s interest to our Director. Bob proved himself to be an excellent candidate for the position, and we were delighted when he accepted our offer of employment. When asked what he likes most about working at St. Anthony’s so far, Bob commented on the characteristic peacefulness of this place, noting that “it’s so relaxing here.” He also noted that Divine Providence was surely involved in guiding him to this job. He’s not yet sure why he was guided here, but he’s glad that he was. So are we!